First 2.3 miles with Muscle Man and the Little Studs, quick stop to play at the park then run home solo. Wow oh wow Welcome new Bloggy Pack members!!! And thank you ALL for your wonderful comments. Yesterday after weighing myself, I had a momentary pity party, it passed the minute I put on my spandex. Muscle Man loaded up the stroller and we drove to a local BEAUTIFUL park with a running/walking path. We run for about 2.5ish miles and at the end we let the kids play at the park, it is a very family friendly activity. I am pretty sure some of the weight on the scale was water because of female stuff. I had stomach cramping while running that is not from muscles. I REALLY REALLY wanted to drive to Seattle and surprise Amanda at mile 8 and run with her for a while...but when I woke up I could tell I was not feeling well. PNW running Bloggers Amanda, Zoe and Kerrie all did great at the Seattle Half!! Hubby and I talked about how the tables have turned...when I was first returning to running, after having Little Stud #2, on this path I would be gasping for air, begging to stop and I could not push the stroller and run due to crazy knee pain. Muscle Man made it look easy. Now 30lbs lighter and with mile and miles run I am the one who runs with ease. Poor Muscle Man has been stuck inside leaving little time for running. He had major pain...guessing it is from his OLD SHOES. After our run I went to the Brooks Outlet and bought him a fresh pair. The Little Studs were awesome snacking on Carrots (Cheetos) and humming Star Wars. At one point the Carrot (Cheetos) bag landed on the ground, so I did a quick turn basketball move and was back in stride. Supermom to the rescue!! The Tall Mom boys! We played at the park for a while then headed home. I was not done running so I hopped out of the car with about 3 miles to home. I was tired, but I wanted to burn some extra calories. It felt good. At one point a lady, with her hair down, was being pulled by hound dogs...she was faster than me...for about 20 seconds..LOL. How do you escape the Monday, or any day, BLUES??? I have been a little nervous to step on the scale....with the holidays, travelling and not getting in high calories work-outs. 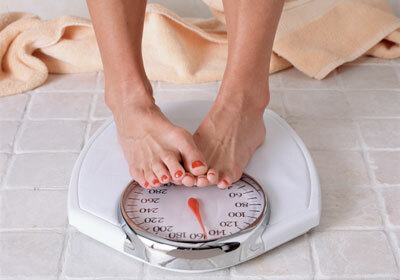 This morning I stepped on the scale.. FAIL!!! I am up 7 pounds. WHAT DID I DO? I let myself fluctuate, I like to be 185 or less, at 6'0 tall that puts me right at the top of the "Healthy" BMI range. As long I am 189 or less I feel OK. But this morning a big 192 slapped me in the face. -Portion Control- I went back for seconds on the tasty Turkey Dinner. -Fruit Juices- I usually avoid high calorie drinks and stick to water, this week I was not so focused and consumed many calories in my cup. -Starbucks- With a Coffee addiction it is easy to get a 400 calories cup of jolt and consume it in minutes while at the Mall. Which is what I did. Repeat after me "Tall, Non-Fat, No Whip." UGH!! -Pie- I had 3 pieces of pie, enough said. -Snacks- We were in the car a lot and it is easy to snack on crackers, Cheetos, etc. I was eating out of boredom. ***So I know what I did to EARN those pounds.. I wrote a post ages ago about how I lost weight and have been able to maintain HERE.. 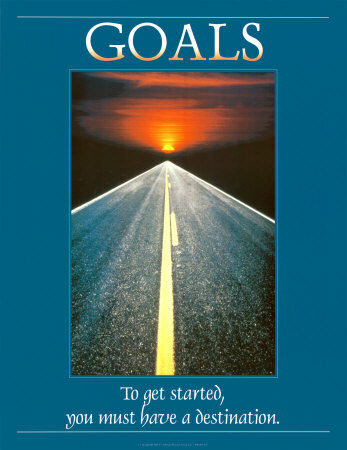 I will use the same strategies that helped me before. Lots of running. Fruits and Veggies. Water. No frilly coffee drinks until I am back down. No Desserts. 100 Calorie=1 Mile mentality. So there you have it, I admit it I splurged, which is OK. But I will not let those 7 pounds become more. I have a plan! Will let you know how it goes. Will you be working off your food this week too?? Yes folks...as we ran the "Your Speed" sign flashed a big 6. Hmmmm... Always up for a challenge we raced up and down the school zone sidewalk to see how high we could get the sign to register. Tall Mom top speed 13, Muscle Man 16, WOW!! That was really fun, I highly recommend that you journey to a local "Your Speed" Sign near you ASAP. As we jogged back I saw something moving in the wetland river area below the bridge. It was a family of Deer with a 8 Point Buck!! We stopped in awe of the Nature just feet below civilization. The Buck looked up at us as if to say "Go Away and let us enjoy our drink!" Oh how I wished I had my camera, but alas these amazing moments will remain in my mind. We ended the CHILDISH and LOVELY run with a S-P-R-I-N-T. I get slower and slower as I run so I need to work on my finish line kick. Hubby pushed ahead as I wanted to slow...but now way. We both surged to the next cross-walk, I checked Garmin 4:59 pace. YAHOO!! Heartbeat on high we strolled back to the kiddos. AKA Bloggers I have met and Love! Amanda- 3 Running dates and she has captured my heart. This girl has speed she has not even touched yet. I guarantee that she will have an amazing race, if the Seattle Weather will give her the little push she needs. Zoe- This fashionista makes everything she wears look good. With an infectious smile the Seattle cheerers are in for a treat!! Go lite on the suds Zoe, no need to cover the course in bubbles..
Kerrie- The Mom is ready for her first 1/2 Marathon, I just hope she can find a puddle free coat. Hugs and love, enjoy the finish line!! HIGH FIVE it's Friday (The Weekend)!!! What do you need a High Five for Today??? 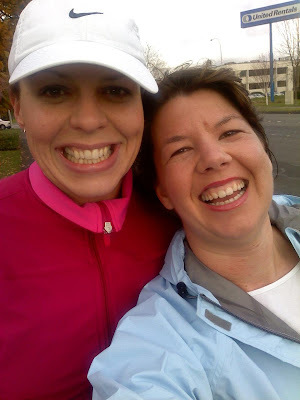 Fellow Pacific Northwest Blogger and all around AWESOME Alisa at Ambitious Aspirations hosted a Virtual Turkey Trot...FREE of charge.. 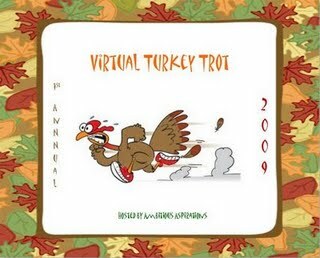 I toyed with signing up for a local Turkey Trot, but with the hefty price tags and chance of RAIN the virtual race was PERFECTO. This morning Muscle Man recruited me to his home GYM..AKA land where he got Buff. We spent the morning lifting and toning, my left leg needs some major strength training. Before we knew it hours has passed leaving little time to RUN. My ambitious side hoped to post a Half Marathon today, but with the rain, lack of time, and HEAVY jogger to push we opted for the lowest mileage and ran 1 Mile as fast as we could as a family. Look at the adorable bib!! Love it.. I wanted to print it and pin it to my shirt, but this was a busy week and I never got to it.. BUMMER!! Yes Little Stud #2 has Cheetos...it was dangerously close to nap time, the Cheeto Puffs were our way to avoid a major blow up from the almost (late January) terrible 2 year old. Quick pre-race photo and we were off.. Muscle Man had not run in a few weeks and my legs were a little tired from the home gym lifting...but we were going to TRY our best to post a good mile time. The puddles were FULL and my feet got wet instantly, time to toss my Asics with the holes in the toes (photos soon it is pretty funny). The double jogger pulled us down the first hill and I could not breathe well with a congested head. YUCK!! We got to the half mile point and I knew we could get a sub 7 minute mile...pretty darn good for a Rainy day while pushing our kids after having worked out for over an hour. As we approached the next downhill Muscle Man said "I will go ahead but you don't have to keep up, you will catch me on the uphill." I fell behind a little but tried to get my speed back up. One Mile goes pretty quickly. We knew where the finish line was as this is our usual 3 mile training route. I promised Hubby that we would walk back after the mile, so he gave a final PUSH. My boys surged ahead as I trailed 3 steps behind. Garmin Chimed. Weather wet and cold. Ready for TURKEY!! Little studs were awesome...pretty easy to keep them happy for 20 minutes.. But they LOVE LOVE to push on the rain cover, one day the foot will go through I know it. I was so proud of Muscle Man for giving it his all and posting a sub 7 minute mile. Unleash the kiddos.. When we got home I had 30 minutes to shower, get pretty, change, get the boys dressed, pack for the day, get the veggie tray ready (Muscle Man Stepped in), and buy flowers....SPEEDY!! Pretty sure I moved faster in the house than I did on the road. We were blessed with amazing food and family at the Tall Grandparents house. Thanksgiving photos soon.. Make sure to enter my Giveaway!! Hope you are enjoying BLACK FRIDAY!!! Because I am a fan of Lists and the #33, here is a list of 33 things I am Thankful for... Make it through the list and you may be handsomely rewarded. 1. Muscle Man and his amazing skills... The Man can do everything cook, sew, fix the car, flip a house, run a 5K, change a diaper, the list could go on and on..
2. Little Stud #1's imagination and willingness to PLAY. 3. Little Stud #2's soft cheeks and cuddles. 4. My Marathon Medal framed and hanging on the wall, reminds me that even on a bad day you can be proud. 5. Living close to Family and Friends. 6. Wedding pictures and returning every year to where we were married to celebrate. 7. Date Nights, although they are few and far between...after 8 years I still get butterflies. 9. GREAT gifts from years past, my camera and Garmin come to mind. Thanks Mom and Dad. 10. Hot Showers and Bubble baths. 11. Hunting for the perfect Christmas Tree. 12. My 10 Year High School Reunion. Planning it with an amazing group of people and the friendships that developed. Love you ladies Lynette and Jilly!! 13. The strength of my feet hitting the pavement. 14. Finding the best quote or picture for any occasion. 15. A Best friend who has known and loved me since I was a little Tall Lady and helped me as I became a Tall Mom. 16. Parents who are supportive, kind and great Grandparents. 17. Lots and lots of RACING options in Washington, Oregon, Idaho and California. 18. Memories of walks in the fresh snow, and jumping on the mattress in the living room when the power went out. 19. Long Length pants and Shirts. 21. Meeting new Bloggy friends, in person Hugs to Amanda, Kerrie and Zoe and online, Welcome new Bloggy Pack members. 22. Facebook updates and photos keep me connected to friends and family. 23. Songs that take me back to Basketball pregame warm-ups and Elementary skating parties. 25. Reading Comments from Bloggy friends near and far. I am a little busy today but will make it around to return the Love soon.. LONG WEEKED!! 26. Canadians.. I seriously think people from Canada are AMAZING!! You know who you are..
27. Sending Random Cards to people who least expect it.. (Email me your Address if you want to join the Tall Mom Mailing list tallmomontherun (at) hotmail (dot) com). 28. Christmas lights and decorations. 29. Thanksgiving food and DESSERT! 31. Coffee and those who love Coffee as much as me (Lacey comes to mind). 32. Planning my 2010 racing schedule and training hard for some KILLER PR's. Knowing that I have the mental and physical power to achieve my goals. 33. Hosting Giveaways for all of YOU!! And trying to win on many other Blogs. This Thanksgiving 33 is sponsored by GoLite. Since you made it through the list that means that you are truly a Tall Mom READER...so you get a BONUS ENTRY for the Red Travel Tote. Just drop a comment with the words Thankful 33 and the number you most relate to (In the Giveaway post). ADDED BONUS: If you decide to purchase any GoLite products you can get an additional entry into the Giveaway. Just tell me what you bought.. I love a good life Analogy, take my "Fill Your Pie" post for example HERE. With tomorrow being Thanksgiving it is the time of year where people take an extra few minutes to reflect on what they are truly grateful for. But why do we have to wait until the end of November to be Thankful?? When I stop and focus on all the blessings in my life I could fill bags and bags with Thanks to carry with me year round. We know nature has the power to make us all happier. It’s the joy of a long run before everyone else wakes up, watching the sunrise after a mile of killer switchbacks and finishing with bagels, coffee and good friends. Or a hike after work that culminates at happy hour. Whatever it is, it’s that moment of aerobic-induced clarity that makes every day better. This experience is not limited to exotic locations and bagging the highest peaks. Nature is everyday.It’s all around us, outside our front doors and in our backyards. GoLite is about discovering nature in unexpected, everyday places. ***GoLite is dedicated to make high quality light products which have a smaller impact on the environment because they utilize fewer materials. 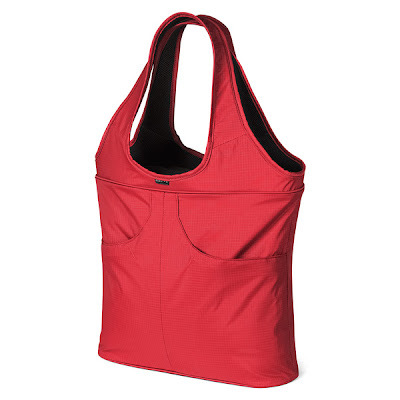 A $70 value this amazing red Travel bag has a pocket for everything, making travel, even in the airport, a breeze. Durable recycled nylon straight from back country packs. 1. Click on GoLite and Shop around HERE. With backpacks, tents, clothing, hydration systems and more you will be busy. Come back and leave a comment about which GoLite product(s) you will add to your Christmas List. 2. What is in your Bag of Thanks? Leave a comment. 3. Share this Giveaway with others, Link on your Blog, or tell a friend. Leave a comment. 4. Become a Bloggy Pack Member (Follower of Tall Mom) and let me know or if you already are a Strong Pack Member what topic you would like to see posted on Tall Mom in the future? Leave a comment. 5. When is your next big race or life event? Include the date and location. Leave a comment. 6. What holiday traditions are you excited about? Old and New? Leave a comment. 7. Play with Tall Mom Friends. Join Amanda's Holiday Bootie Buster Challenge (HERE), Alisa's Virtual Turkey Trot (HERE), or J's Gift Exchange (HERE). If you already have take credit. Or invite me to Play on a fun holiday themed Blog event. Leave a Comment. Lots of chances to enter. Winner will be selected by whatever means my Tall Mom head decides, on Thursday, December 3rd at 6:33AM, with the winner announced later in the day. Take along just what you need with this mini travel trio. Sure to become your new favorite travel companion, the essentials balancing system travel set is perfect for all your skin care needs on-the-go! balancing cleanser - .66 fl. oz. balancing toner - 1.0 fl. oz. balancing lotion SPF 15 - .66 fl. oz. Ashley sent me the link to her website and some amazing products for health and beauty Click HERE for the full site. I was very excited to test the skin care products. Having a limited income I generally stick to the $5 or less one-step skin care systems. I have noticed with running that my face feels dry. I tested the full size version of these products and really loved how soft my face felt. I tend to run on the oily side so I have to be careful trying new products. Overall when I have time I really like to use all 3 products. Rich, rewarding, and right for snacking! 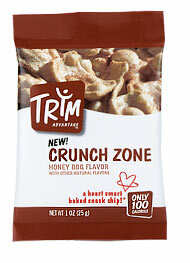 A healthier choice for your love of crunchy snacks. Convenient 100-calorie packs make it even easier to indulge, without bulge – and feed your body a protein punch while you’re at it. Again I am no nutritionist, so if you want the package details go HERE. When I was really focused on weight loss 100 calorie snack foods saved my life. 100 calories= About 1 mile. If you think that way the candy bar and fruit juice are not as appetizing. These Chips packed a tasty punch and did not break the calorie bank. YUMMERS! From chips to lips. I have never spent more than $4 on chap stick for my lips, so the sticker shock of this lip care system is too much for this tight wad to take....BUT... Wow oh wow! Who knew that rough lips could be cured with a little exfoliation. Follow that with a soft tasteless gloss and your lips are back to kissable. 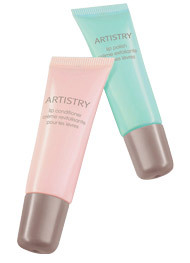 This is no stocking stuffer, but is a great product for those winter chapped kissers.. When one bottle, a couple of gel packs, keys and your ID are all you need, reach for the HydroClutch. Also a great way to add quick access hydration capacity to a larger pack. A favorite of seasoned trail runners. I has a stretch nylon bottom and collar which keep the bottle snug. Reflective webbing for increased visibility and a zippered stretch air mesh pocket to hold Gu, cash, etc. Comes with a sport bottle that is biodegradable, recyclable, reusable, made with recycled content and BPA free. It weighs 4 oz. Mesh pocket makes it easy to spot what you need to grab out, Gu's, Chomps, there is no mystery with a turn of the hand. Easy to open and close top. There are some bottles with WEIRDO spouts making drinking an EFFORT. Hello like I need to try hard to get a drink. This top I pull up with my teeth and close just as easy. Thick adjustable strap. 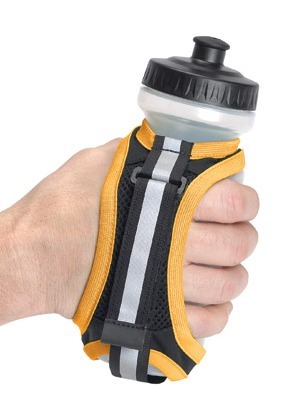 I have tested bottles with thin straps which cut into my hand and caused irritation on a long run. This strap is so comfortable that I forgot I was holding a bottle. It won't fall off so you feel hands free. Light weight. My Garmin feels heavier than this bottle when it is totally full.. (Note: my arm pain from my 13 mile run was not on the water bottle side). 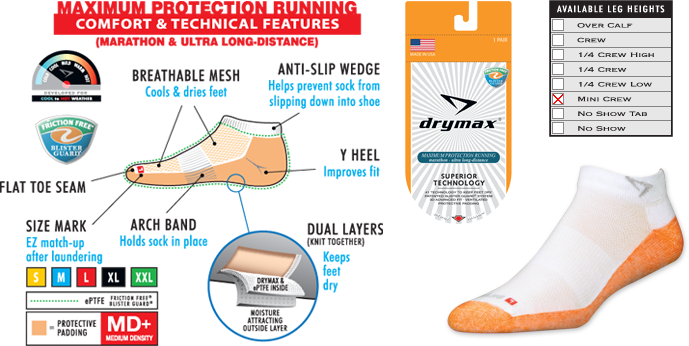 Reduces my Footprint and will make me faster. This product, like all GoLite Products is environmentally friendly and made from recycled content. If I carry this in a race I could save a few cups and water bottles. I will also be able to pass the SLOW water stations which could give me those few BQ seconds I need. ******Stay tuned because Tomorrow there will be a GIVEAWAY and I will give you a little hint....you will learn more about GoLite. If you can't wait to check out what GoLite has to offer, go HERE to shop.. When I was in 8th grade I was VERY focused on basketball. Friends Lora and Sarah recruited me to TRY Volleyball. Always up for a challenge...I started Club Volleyball. Volleyball was always my fun sport...my no pressure on myself, Spike and Block as hard as I can sport. Last year I was MISSING Volleyball and started to play in a co-ed competitive league and this time I recruited Lora. This Fall Lora and started a new team with the help of our friend Shannon (who we played club Volleyball with when we were teenagers). Shannon brought a POWER TEAM with her sister Kristen, brother-in-law Seth, and Friends Matt, Sean and fill-in Greg. Last Night we clinched the 1st Place Title!! This season was SO FUN!! The people on my team were competitive, but not to the point that it was too serious. We cheered each other on and had a HIGH FLYING blast! Our Cheerleader and paparazzi Lynette came to the game last night and took the pictures below (THANK YOU LYNETTE). Winter Season starts in late January and we will be back to defend our title. The Power team from Left- Matt, Tall Mom, Shannon, Lora, Seth, Kristen and Sean. After running 13 miles the day before my legs are a little spent, but I can still get up and BLOCK!! No missed serves this day.. WOOT! Rockin it in my new socks.. Thanks TMB! And what do you get for 1st Place? T-Shirts and a Volleyball. We hopped around like kids after we were awarded the SWAG. Proof that I am TOTALLY RANDOM and not afraid to talk to anyone and everyone. Who does this guy look like to you? Hint: The Office. I could never focus when we played this team because of the uncanny resemblance to Steve Carell. I just wanted to laugh the whole game.. So I asked him if we could snap a photo..thankfully he humored me.. (as he did the whole season). There are so many things in life that give us JOY and really keep things FUN! What do you truly enjoy doing? And if you are not doing that thing now, why not? No Pirates or accidents to get in the way of the start of our 3rd Running Date. To me the 3rd date is make or break time...do we want to pursue this further?? My vote YES!! I am 333% positive that Amanda and I are going to be GREAT running buddies. 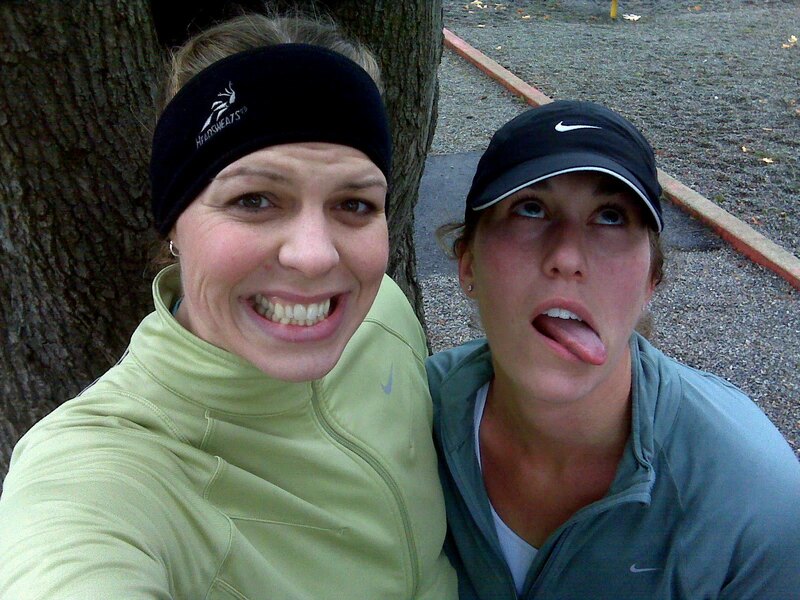 Next weekend Amanda will run the Seattle Half Marathon, read all about her HERE.. I know she will be AMAZING!! It was COLD this morning 43 when I left my cozy Jeep. I was having wardrobe issues, as in I could not decide what to wear. We opted to run toward town and pass the cars in case we needed to strip off a layer. IT DID NOT RAIN.. Should I repeat that? IT DID NOT RAIN. It has rained nearly constantly for days and the puddles were full, but nary a drop fell during our 13 miles. Yes we ran 13 miles and Amanda was a ROCK STAR! There was no shortage of conversation, I love people who talk and LISTEN.. it is very rare to have that connection. Funny as I drove in I saw 5 or 6 groups of runners 2 ladies who did not have their hair pulled back...PET PEEVE..if you have long hair pull it back! Those groups were on the BORING part of the trail, as we ran toward the River portion the path hosted very few runners, we had the path to ourselves. Near the STINKY cow pasture there was a Man with his toddler son petting baby cows with their puppy by their side...total Hallmark moment, the simple things make me smile. We also passed Paul, the owner of the local Fleet Feet, of course he was dressed in PERFECT gear. I tested a GoLite Handheld and it was awesome, if you are in the market go buy it!! Full review on Test Lab Tuesday. Pretty sure that the handheld will be my new race best friend. The only issue I had the whole run was an aching pain in my left upper arm from mile 10 on, the same thing happened in my last Half Marathon. Very WEIRD! I held the camera and was CHEESING...had no idea that Amanda was posing.. Tooo funny!! Guess I pushed her a little hard...Oh well, I only get to play Jillian (Biggest Loser) so often. A Healthy does of Tall Mom and I know Amanda is READY to Rock he Half. TONIGHT the Hit List Vollyeball team will play for 1st Place. I have some Rockin new socks from TMB, THANKS BUDDY!! Team Photos and more on Monday. Have a relaxing and lovely Sunday Friends!! I am sooo sorry to all of the Bloggers I missed last week as I took care of a SICK Muscle Man.. This week we have a FULL racing schedule.. Click on the names to go visit and drop a HIGH FIVE!! Not training for any races right now I have really enjoyed the RUNNING ON MY TIME! And at WHATEVER PACE! I feel like a Zen runner, with zero self-pressure. Will reconnect with Amanda for a 3rd Date training run tomorrow morning..YIPPEE!! Hoping for a break in the clouds and a few less puddles to tromp. Other than that I am HOPING to get some major Christmas shopping done and to pull together the details for a GIVEAWAY next week. Stay tuned! I am going to pre-apologize if I don't make it around Bloggy land to comment this weekend, I won't be around a computer much and need a little PC DETOX.. You are all in my thoughts!! Ashley- Turkey Trot 10 and Gobbler Grind 1/2 ?? Oz Runner- 10K Turkey Trot ? Last Week I wrote about What "Fills Your Pie" HERE. This morning as I drove to work in the rain, wind and utter darkness, I thought about how dreary this time of year is...in Washington anyhow.. The perfect combo to easily slip into an Fall Slump and befriend Polly Pessimism. I refuse to let it get me down. Today I am going to Find One thing to make me SMILE....Or maybe a series of One things (I am sure that is bad English, but you age the idea) to keep that SMILE throughout the day today. I hope that you will join me...Need some Help?? Finding the right words to get you out the door, regardless of what Mother Nature has to throw at you..
People who are just a bit CRAZIER than you are.. Note: I am bundled up with a rain coat, hat, tights, etc. This MANIAC is in a singlet and Gold chain, not fazed at all by the elements, just running his Marathon..
Santa in the Honey Bucket Line.. Can you spot him?? This proves that even the Jolliest of Fellow must be patient..
Raising Best friends, watching them play and grow together. Knowing that this post might help one person SMILE... Makes my dimples shine.. Tall Mom Hugs on a Dreary and Dark day in Seattle... SMILE!! Welcome to post 300!! If you expected a Giveaway....well you are a week early, here's a hint, THANKFUL Giveaway :) I racked my Brain to think up what to do for my 300th post...as my Brain is a bit taxed this week I will tell you all about my PLANS. J, Velma and I are hosting a Gift Exchange. Go visit J HERE and enter.. This is going to be soooo fun. We will all be matched up at random with another Blogger from lands near or far. 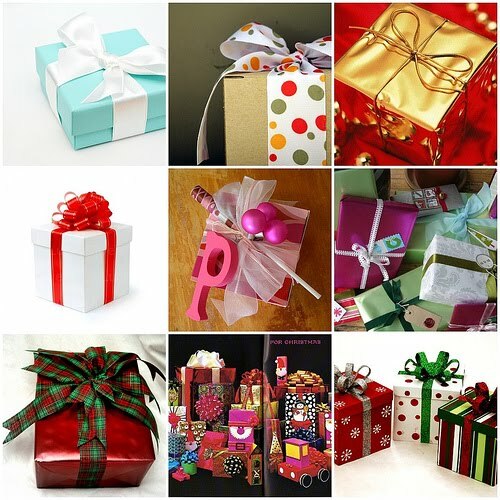 It is a chance for creative Giving....and added bonus, you are guaranteed a GIFT in return.. Yesterday I had an amazing Lunch Run with Kerrie. Read her recap HERE. We work just 1.3 miles away so I ran to pick her up, we strutted together for about 30 minutes and I dropped her off. This run was in a word RELAXING! The path we randomly happened upon (a hidden OASIS) is a wooden plank raised bridge above an overflowing wetland marsh. I have never been on the path before, but I plan to return many many times. AMAZING!! Kerrie planned ahead and brought her camera.. CHEESE!! As you know I am a PLANNER!! I have been on countless websites trying to decide which of my racing options will be best for 2010. Around March we plan to sell the Tall Mom House and move closer to my office...which will make the budget and time a little tight.. As I am always focused on balancing Time/Money/Family, I have come to a tentative PLAN. 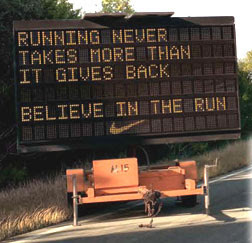 *Marathon Redemption. The Fleet Feet Marathon training program starting on January 9th will prepare me to traverse the Hills of T-Town. The low cost of entry fee $60 and 30 minute drive are great on budget and time. And being a local race I am HOPING that I will have a cheering section...note: I love big bright signs and to have my picture taken. *This race was my first Half Marathon, both Muscle Man and I loved the whole experience. A Small, well-organized race, in the Capital City, with great race shirts and a downhill Finish Line. Hopefully I can recruit Muscle Man to run this one with me. Honey?? *Running with Charity and Lynette...and anyone else who wants to wear PINK and run for a great cause. *Running with Shelby for her First Marathon. I told myself I would NEVER do this race again. It is TOUGH. But I want my running buddy to have the best first Marathon EVER. So I will be there with her, at her pace for 26.2. I am so excited to see what we can do together!! I know there will be 5K's, 10K's and many other races added in here with options to run races in the Portland area as well. If anyone wants to buy me a GREAT Christmas Gift entry to any of these races would be AWESOME!! LOL.. In 2010 I will try for PR's yes...lord knows I love to push my limits. But as you can see most of my races will be run with friends and family...which I truly believe will make for cherished memories. I TRIED to come up with a graphic to go with my theme...but I ran out of time...so stay tuned for that.. This is a day I dedicate to all things that I review...Running, Eating and Living. I love the coloring of this shoe because it matches with everything!! I am between sizes on the Trance 9's so I have a pair that is a little too big. This works well for days when my feet are swollen after a long run. I also find that I wear these nearly every day just because they feel so good. Light, airy and very well made. I eat one of these every morning with a cheese stick. YUM!! It is like having a candy bar for breakfast. I know these probably don't have the highest nutritional value..but when I was trying to lose weight, these were my snack of choice not to break the calorie bank. Muscle Man and I were VERY LATE to jump on the Twilight bandwagon. My speed reader hubby has read the Harry Potter series from cover to cover several times and needed something new. So we borrowed the Vampire inspired series from Tall Grandma. He read the THICK first book in a matter of days (I envy those who can consume books quickly, I am a book nibbler, AKA Slow reader). We then rented the movie which I LOVED!! Mind you I am a teeny bopper movie fan. Watching Oprah, while taking care of sick Muscle Man, I discovered that the books are the brain child of a 35 year old stay at home mother of 3!! WHAT? Inspiring! This week is a BIG WEEK for fans (fanatics) as the new movie comes out.. I have yet to read a book, but I am sure I will be sucked in soon. And I can't wait to see New Moon. I won these socks from a Giveaway on Run Like a Girl. AND they could not have come at a better time. The RAINY season has hit the Seattle area. I wore these socks on my LONG run this weekend, as I hopped through puddles my toes stayed dry. The technology WORKS!! It is like Magic. My Office Mom, the lady who brings me food and Gossip Magazines, had a bag of carrots on her desk. When you think carrots you think Orange, Right? WRONG!! She had a bag with Orange, Yellow and (GASP) Purple Carrots. 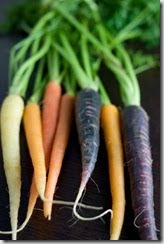 Baffled I did a quick Google search and on Carrot museum I learned "It is considered that purple carrots were then taken westwards where it is thought yellow mutants and wild forms crossed to produce orange." I had to try the oddly colored veggie. Verdict...tasted like a carrot crossed with a beet, or maybe I was just projecting the flavor on it. Either way very yummy and very weird! I hope you enjoyed this segment of Tall Mom Test Lab Tuesday. If you are counting this is post #299.. What will #300 bring?? Stay tuned to find out.. Welcome to all the new Tall Mom Bloggy pack members!! This week is busy but drop me a line and I will do my best to come say "Hi." Rainy run on the Foothills Trail in Orting with Amanda. I must have done something right because I scored a Second Running Date with Amanda at 5 Miles to Empty, you can read about our First Date HERE. We were hoping for a quieter meet up and parking situation after the parade and carnival last time....BUT apparently that was not in the plan. I parked and waited... and snapped a picture of my experiment with black nails...dedicated to TMB.. It was drizzly raining when the phone rang. There was a fatality accident on the main road...as in there was no way for Amanda to get to me.. She asked the passers by who said she was about 3 miles away. Guess we would have to RUN to each other. As I ran I kept seeing Amanda mirages, until YIPPEE she did a little skippity hop and I knew it was my buddy. We were both in bright Green, too funny. As we ran toward my car we realized that the Green coats would be too hot so we stripped them off at my Jeep. I stopped my watch...she didn't LOL!! As we headed toward the trail We had to do some MATH.. Math and running do not mix, we were both transported back to Elementary Story problems. UGH! We had run 3 Miles and needed to do 11. So Amanda said 11-3=8....NICE good start.. OK so if we need to do 8 more miles, then we go 4 out and 4 back. So 3+4=7. We turn around at the 7 mile mark.. Thank you for enjoying our Sesame Street Moment. GEEEZZ!! I tried to stay half a step behind Amanda to make sure I was going her pace...after all I was just along for the ride. She is training for the Seattle Half later this month. We talked about Garmins, Holiday plans, Bloggers, Blogging, Races, kids, her vacation and pretty much whatever was on our minds....there was no shortage of conversation. I tested my new handheld, which I LOVED and will review soon. As we were running a tight pack of SERIOUS bikers passed on the left. There were about 8 of them, we waved and heard "Hi, Hi, Morning, Hi, Hello, Morning, Hi!" You get the idea.. Not sure why I thought this was so funny, they reminded me of a pack of Geese moving in perfect formation. A clear reminder of why I don't bike, I would have knocked the whole pack down. The path smelled of Cow and dead fish...YUMMY!! The rain helped the smell a little, but not 100%. We hopped over puddles, trying our best to keep our sneakers dry. All in all it was a wet but very successful 2nd date. And guess what?? Pretty sure the 3rd date is this weekend..
My attempt to take our photo.. This was after 11 mile...we both had matted hair and were soaked.. My coffee and hot shower were much needed to WARM UP!! Amanda is better at the self photos than I am. Loved my new Helly Hansen shirt and Sugoi tights.. THANKS for an amazing time Amanda!! ***NOTE: I also played 2 hours of Volleyball yesterday and my team ROCKS!! We are in 1st place with 1 week to go. Have a Happy Monday Bloggy Land! You have nearly 300 posts in 9 months. Your Long run got postponed for a day and you are disappointed. Your other half is sick and you fee like part of you is broken. You can barely focus on reading and commenting in the Bloggy world. ***Yesterday I played Stay at Home Mom to the Little Studs and a VERY SICK Muscle Man...let me tell you it was DRAINING!! Respect and admiration to the Stay at Home Moms and Dads in the world... My coffee is not helping this morning and we have plans to go to a birthday party today. I have a Second Running date with Amanda (5 Miles to Empty) for tomorrow...YIPPEE!! 11 miles of FUN.. This week I totally made up for last week of zero running. I ran every day expect for Friday... CRAZY!! And guess what?? I made it over the 900 mile mark. Yes folks less than 100 miles to get to my Goal!!! Wishing you all an amazing weekend. I am off to see if the Richmond Marathon has online (stalking) tracking.. HUGS!! I woke up at 5AM to the sound my Muscle Man expelling his dinner. Poor guy is SICK! So I will be staying home to take care of him and the Little Studs. And Praying I can avoid the gunk..but since my throat already feels like it is closing ujp I am guessing I won't be able to avoid it. I am miles away from my Tall Mom Calendar....so the LONG list will be limited to the few I can think of... Sorry bad memory..
Lil Runner= Clif Quench Ends ? I am on the Monthly Email list for the Bonney Lake Fleet Feet. Last week I got an email about "Diva Night." Wine, snacks, product demos, 20% off, all for ladies, the store open to cater to us!! It was super fun..Thanks to Coleen and Paul, the owners, for hosting. I forwarded the email to local Bloggers and friends. Zoe was able to attend. Folks this little lady is just as Glam in person, can you say ADORABLE!! Funny thing, I spotted Zoe across the room, easy to do at 6'0. There were maybe 30-40 people?? It is a tiny place and was pretty packed, which made it HOT and I kept elbowing people. They started the Door Prize Drawings and first Name Called "ZOE." So funny! She walked past and quickly noticed me. She won a little bag with lotions and fun things. My BF Charity was my date for the night. We did Applebees, Shopping at Marshalls and ended with Diva night. Thanks to Muscle Man for watching the little studs. We should have asked someone to take our picture....Anyhow on with the drawing, next name after Zoe's Win. "Melanie," Wait what?? OK so what did I win? I was only half paying attention because I was excited to meet Zoe. The Moving Comfort rep was standing there with an ENTIRE OUTFIT!!! Me with Teresa the Sales rep for Moving Comfort.. I still need to get one of the "Support Your Girls" T's, I LOVE LOVE them!! And what did LUCKY Tall Mom win?? A cute and soft green T-shirt with Flower detail, super awesome Capris with pockets. And a Green jacket to match. The outfit is a medium...yes folks I fit in a medium, when did that happen O have been an XL my whole life? The jacket is a little snug, but it will work! Thanks to Moving comfort and Fleet Feet! Of course I have to support my local running store and had earned some retail therapy. We purchased a $100 gift card for $50 from a local radio promotion.. So I had some fun money to play with. I got this Helly Hanson base layer top and a handheld water bottle...will test it this weekend and let you know.